At 6’5” sporting a lean athletic frame and weighing a comfortable 94 kgs, 28 year old Usain Bolt is rightly prefixed with ‘lightening’. 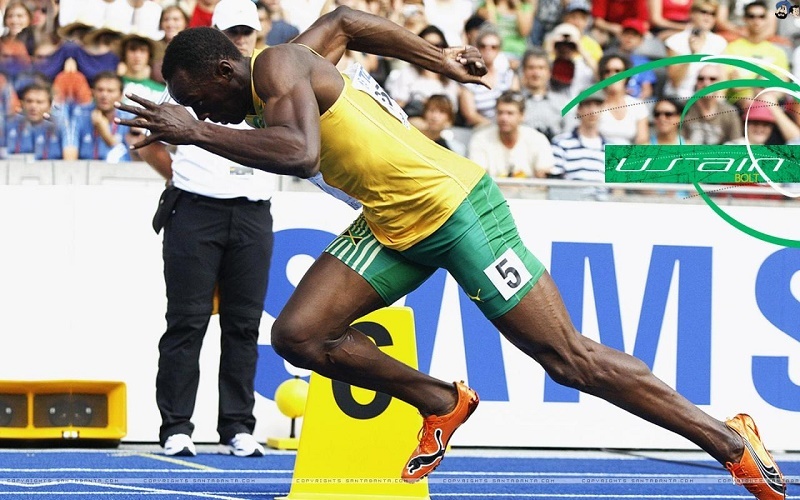 His prowess in the world of track and field has often left us wondering how at all he manages to accomplish 100 meters sprint in 9.5 seconds which in fact, makes him the most successful athlete existing in this century. He is fast and he is furious and this is one of those essences of vitality that most of us the ordinary often wish and sometimes resolve to attempt. He glides through the tracks and there is practically nothing that seems to slow him down. This is perhaps the reason that has raised an alarming level of curiosity about the fitness and diet secret of Usain Bolt which makes him an unprecedented and nearly infallible champion. Keeping this enthusiastic curiosity in mind, here is a glimpse of the diet and fitness schedule of this once-in-a-lifetime King of ultimate Athletics. In all honesty, Bolt is a bit too tall and with slightly heavier musculature to sprint the way he does. More often than not, the champions of the yesteryears have been a little lesser in mass that this track and field enigma. However, there is something that has enabled him to produce such dramatic performances, and his training / fitness schedule can be thoroughly upheld for this. Basically, Bolt’s schedule includes a combination of weight training and plyometric training which supports functional strength. For enhancing his performance, he makes sure to include exercises like squats and lunges with weights, cable leg drives, bunny hops, frog jumps, ankle rolls, high knee skips etc with an average of 8 to 12 repetitions in each. At the same time, he also ensures proper and adequate circuit training and core strengthening exercises for overall fitness. Flexibility training and sprint drills also form an integral part of his schedule. Bolt engages in 3 hours of intensive exercising every day. He follows up this tiring schedule with ample rest, relaxation and massages to de-stress his system. Bolt’s daily meals are divided into 6 neat divisions each of which contains all basic nutrients in the right amount. Proteins take the lead in his meals comprising 60% of his meals consisting mainly of lean chicken, pork and fish. The rest of the 30% is carbs to fuel the protein and the remaining 10% is fats. Taking supplements is not exactly his form of diet maintenance which is unlike infinite other athletes who have made it somewhere in the list of champions. However, he has revealed his need to take Vitamin C which is the only supplement that has found a spot in his diet plan. Bolt has also expressed his love for Yams and the need to stay hydrated to maintain his form. A cautionary not for enthusiasts… Bolt engages in his diet and fitness regimen according to what he is required to achieve in the tracks and also according to what his body can handle. If you need to get a body like Bolt or if you are a tennis freak and in love with Nadal and want to achieve even a fraction of fitness of this sports legends, you need to consult a professional trainer for the purpose.